Home › Social Media › Use Social Media However You Want! 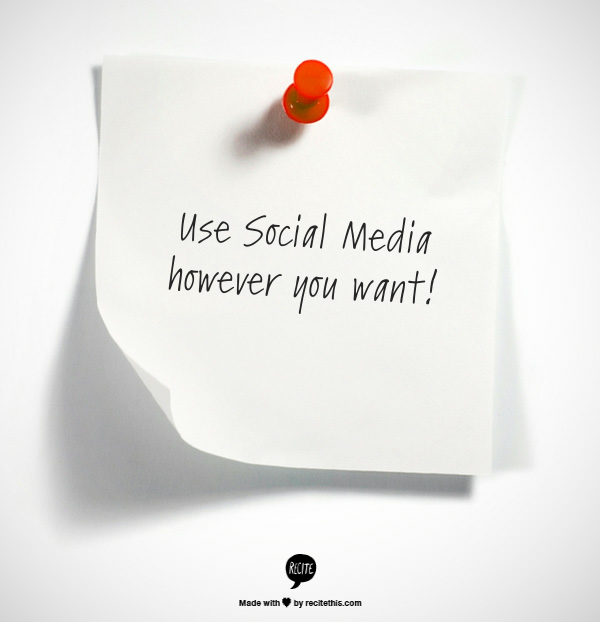 Use Social Media However You Want! You’ve probably seen articles with headlines like “The Five Tools You Need for Twitter Success”, “Seven Techniques for Building Your Facebook Audience”, “Why You’re Not Succeeding on Social Media”, etc… Maybe you’ve even read a few. I have, and they’re not all bad, some of them are written by people I respect, and who I believe are trying to help others succeed as well, and if you listen to these people close enough, especially when they’re talking about matters like trust and authenticity, you can gain valuable insights from them. Use social media however you want to use it. If you’re thinking, “Wait, that’s it? Just do whatever I want and I’ll be successful on social media?”, the answer is no. I can’t guarantee you success. What I can guarantee is this: if you don’t use it however you want to, you will fall out of love with it. You have to love what you’re doing, or you came off as inauthentic (even if some people fail to see it), and if you love what you’re doing, you can easily spread that enthusiasm infectiously to others and build relationships with them. This isn’t a strategy. Strategies are for wars. Social media is nothing if it isn’t social, and like real life, you shouldn’t approach every interaction with a strategy. If you have a strategy at all, it should be to make stuff you think is great, and put it out there to see if anyone else feels the same way or to meet others doing stuff you think is great. There may be some basic tips that can help, but only to make this easier. Here are a few tips on Pinterest: Get Started on Pinterest for Business. If you love technology and writing about it, then do that! If you love cat memes, share them! If you’re a selfie queen, go for it, just keep it safe for public consumption, because the internet is forever. If you’re a SciFi geek, tell people what you think about it! If you’re an optimist, you go ahead and share that inspirational quote! Above all, be real, and don’t always feel like you have to be “on”. Don’t always hide your blemishes. Talk to people, and not just at them, because you are the entity behind that profile and if you’re not real, then they’ve got no reason to stick with you when some new shiny thing comes along. I am referring here to personal accounts, of course, and much of this may not apply to businesses and organizations, but even there, I worry that the industry seems to be reverting, devolving to one-directional marketing and hollow attempts at social engagement with the audience, bogged down by bureaucracy, old ways of thinking, and prickly legal departments. I would rather work with a business that wants to make genuine connections with their customers, to build an ongoing social dialogue, than one that thinks of social media as just another broadcast medium or high tech customer service center. I worry, too, that however well meaning it may be, approaching social media from a purely strategic point of view has caused the industry to resemble the pre Panda SEO crowd. I understand that the client wants results, and if you can’t show them, someone else will by hook or by crook, but never forget that you are creating social content, not advertising in the old sense of the term. Quality of relationships cannot be left out of the equation in favor of pure follower counts. Panda, in case you were hiking in the Himalayas when it happened and didn’t hear the millions of affected websites all cry out at once and then suddenly fall silent, was when Google, tired of “thin content” all over the web, decided to drop a nuclear bomb on “low quality” websites. Many have never recovered, because their designers had no plan for when their tricks fell apart. They brought no quality of their own to the web, merely siphoned a bit off the surface of others and played the game better. Honest SEO’s warned their clients against this, even if they lost business doing it, and their clients survived it. More on Panda here: How to Recover From a Panda Penalty. We’re in the pre Panda days of social media, ladies and gentlemen, and some day the bomb is going to drop, and when it happens, there will be much lamenting and gnashing of teeth as the “low quality profiles and pages” plummet into the internet abyss. I’m not worried for myself, because I’m doing what I love, the way I want to do it, in real time, with thousands of great people from all over the world interacting and sharing their own contributions to the “Long Conversation” of social media. SEO’s reputation as an industry was ruined by folks who were trying to pull a fast one on the Search providers, and their clients. They didn’t necessarily mean to do harm, they were just using something that seemed to work, and who isn’t tempted to use the cheat codes when you have them? Especially when competitors will do just that: promise the easy answers, the easy fix, the sure thing. Where are those people now? Desperately trying to find new tricks and clinging to the ones that still haven’t been hammered by The Almighty Algorithm yet. They may be getting company soon. For more on SEO in a very competitive industry use our Personal Injury Lawyer SEO resource. Already the signs are shaping up that the social networks want authentic social engagement around quality content that generates enthusiasm to rise to the top. We can quibble over the term “high quality”, but that’s a matter of personal preference or prejudice, if the person behind the profile is authentic and their activities generate comments and shares and conversations, then they will find the sorts of connections they came to the social network seeking. In the end, what really matters more than that? Absolutely. I see book after book with rules. I feel the same way. First it must be social and real and you. Eli has it right. Simply said. Excellent. This article touched every point that needed to be made for people to be themselves and not just their Community. That is what I got from reading this. Sometimes you just count reshares and +1’s. Pay attention to the people that responded then. I you do, then they might want to reshare. It seems clear to me that Google is very protective of its position as a provider of accurate search results, and just like they came down on black hat SEO tactics, I’m sure that they have a close eye, and algorithms already in place, to monitor activities on G+ geared towards “gaming” the system. I think that the folks that think that just circling influencers and +mentioning them to oblivion are living in a delusional fantasy if they think that those tactics will build their own authority. Google keeps saying the key to success is to “Create great content”. I feel that applies on G+ as well. Volume and velocity of social activity will not be something that they will place much weight on (IMHO). Google+ is the social layer for Google Search. I’d expect Matt and friends to be just as vigilant protecting “social signals” as they have been at protecting the quality of search results. Eli hit the nail on the head. If you are in it for the long haul and you don’t want a flash in the pan type of account it takes using social media in the way you desire. There are plenty of fake Twitter and Instagram accounts that get plenty of retweets or likes but are the users really getting anything out of it? They might be getting some self satisfaction here and there but ultimately they are playing a game to get more likes or retweets. If you truly want to get the most out of your social media experience curtail it to your life. Find and associate with those that are like you. If you are a sports guy talk about sports. If you are a fashion gal talk about fashion. Do not adjust your entire posting strategy just because someone tells you to. I am stubborn and like to do things MY way, or I would be going nuts trying to jump through all the hoops people put out there. Occasionally I skim through a here is how to do it, because I say so, article. And sometimes there is a nugget of info to be learned. Most of the time the posts are just same old, same old, that 20 others have jumped on the bandwagon and are repeating. The best articles are the ones that tell people how to do something, not you must do something. Example: starting out on G+ seems to intimidate some, and those handy what you need to do and here is how to do it posts are gold for those people.